The diagnosis and management of combined anterior cruciate ligament (ACL) and medial collateral ligament (MCL) injuries have been a controversial topic for several decades. No single approach has proven optimal for treatment and there is no consensus between most specialists. This review seeks to describe and clarify the current state and the future of management. Most authors agree on reconstructing of the ACL with non-operative management of the MCL in grade I and II injuries, respectively. However, controversy still exists about the optimal method of treating a combined ACL with higher grade MCL injuries. Management should be customized based on acuity, injury grade, and specific goals for each patient. Future research with clinical outcomes may facilitate creating guidelines to optimize recovery. Joshua L. Elkin, Edgar Zamora, and Robert A. Gallo have not received (or agreed to receive) from a commercial entity something of value (exceeding the equivalent of US$500) related in any way to this manuscript. Robert A. Gallo received institutional research support from Aesculap for a novel cartilage scaffold trial. 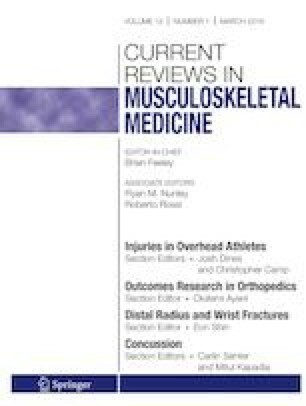 Dr. Gallo is a section editor for Current Reviews in Musculoskeletal Medicine. Treme et al. UFO. Medial ligamentous injuries of the knee: acute and chronic. Musculoskelet Key 2016. https://musculoskeletalkey.com/medial-ligamentous-injuries-of-the-knee-acute-and-chronic-2/ (Accessed 14 May 2018). Grant JA, Tannenbaum E, Miller BS, Bedi A. Treatment of combined complete tears of the anterior cruciate and medial collateral ligaments. Arthrosc J. 2012;28:110–22. https://doi.org/10.1016/j.arthro.2011.08.293. Frölke JP, Oskam J, Vierhout PA. Primary reconstruction of the medial collateral ligament in combined injury of the medial collateral and anterior cruciate ligaments. Short-term results. Knee Surg Sports Traumatol Arthrosc. 1998;6:103–6. https://doi.org/10.1007/s001670050081.